At Grand Valley State University, several precautions are made to ensure pedestrians, bicyclists and motorists stay safe as they pass through campus. During peak traffic hours, there are crossing guards who direct and stop traffic to ensure pedestrians cross the street safely. In addition, there are clearly delineated walking and biking paths through the Allendale Campus on one side of the road to ensure that pedestrians and bicyclists don't collide. Whether you agree with President Trump's decision to end DACA or not, it is hard to take issue with Grand Valley state University President Thomas Haas' student outreach. For members of GVSU's community, the responsibility rests on our shoulders to make our campus environment welcoming to all. Regardless of our political views, this should include DACA students who are here for the same reason non-DACA students are: to get an education. For many students, owning and maintaining a car while attending school is impossible. Due to the cost of gas, repairs and parking permits, as well as the small annoyance of finding a close parking spot, owning a car may simply be impractical for a lot of students. That's where busing comes in. This week, the Grand Valley State University community suffered through the radical, religious rantings of at least one protester on the Allendale Campus. Getting politically engaged as a college student is extremely important. When it comes to elections, millennials hold a lot of influence, as we saw this past election season. 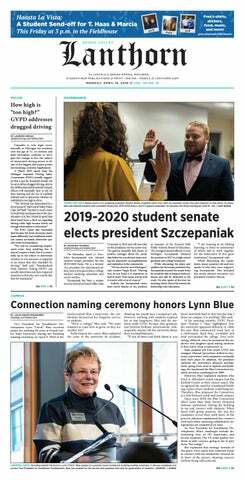 As a new freshman class starts its journey at Grand Valley State University, incoming students will probably hear the term "Laker for a lifetime" tossed around a lot. But what does that designation really mean? At any "good" university, the academics are going to be rigorous, as they should be. When students are appropriately challenged in the classroom, though, it can be difficult for them to fit in extracurricular activities, including ones that may actually enhance their academic learning, provide them with real-world experience, build their resumes and ultimately give them a leg up in the job market. In fact, extracurricular activities like internships, research and study abroad may even prove to be more valuable for students in the long term than countless hours spent studying and attending classes. Grand Valley State University was recently awarded a $375,000 grant to fund an initiative called "Fostering Laker Success," a program designed to support students who have been in foster care. In a sea of more than 25,000 students, it is often easy for individuals, particularly students from difficult or complicated backgrounds, to feel neglected. This grant, though, which was authored by two GVSU staff members, is a concrete example of GVSU's commitment to work actively toward creating a prosperous and inclusive campus life for all students. Between working part time or full time and taking summer classes, many Grand Valley State University students might be finding their "vacation" time less relaxing than they had hoped or anticipated.